With submarines in Sydney Harbour, Japanese planes flying overhead and harassment on our coastline, Australians were fearful for their safety. Anxious parents made decisions to protect their children, with or without government sanction. Small children were sent away, often unaccompanied, by concerned parents to friends, relatives, or even strangers living in ‘safer’ parts of the country. Some had little comprehension of what was happening and thought they were going on holiday to the country. Unlike the sometimes sad and horrible experiences of their UK counterparts, for many Australian child evacuees there enforced ‘holiday’ was a surprisingly happy time. The history of these child evacuees in Australia remains largely hidden and their experiences untold. Author Ann Howard, who was evacuated with her mother from the UK during World War II, has set the records straight. A combination of extensive research and the first-hand stories of the evacuees captures the mood of the time and the social and political environment that they lived in. The voices of over one hundred contributors join together to paint a vivid picture of wartime Australia; the fear, the chaos and civilians floundering under the impact of a war that would change their way of life forever. Ann Howard loves life. She is an enthusiastic traveller and adventurer. She has ridden elephants through the Sumatran jungle; climbed Anak Krakatau when it was erupting; made a 14,000 feet free‐fall from a plane and rock climbed in Tahiti. She brings this enthusiasm to her writing and studying. She enjoys her grandchildren, her partner’s musical gift, her dogs, garden and a good single malt; not necessarily in that order. Ann lives in a heritage house she restored on Dangar Island in the Hawkesbury River, where the four prize winning local histories she wrote are very popular. 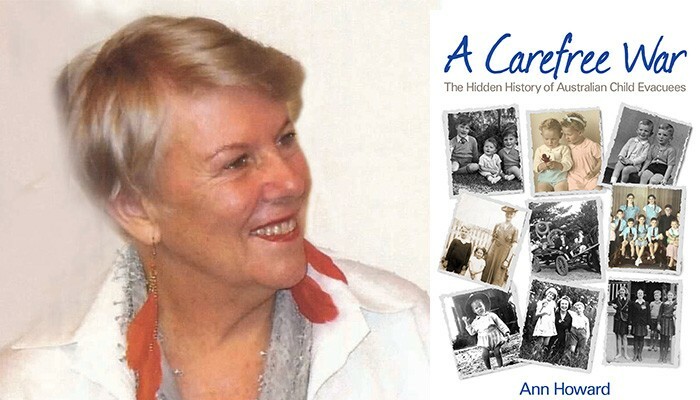 Ann Howard returns to the SMSA to reveal the stories of over 100 child evacuees with her new book, A Carefree War, that paints a vivid picture of the largest upheaval in Australia since white settlement. During World War II, Australians feared for their lives and the safety of their families. The Japanese were coming; there were submarines in Sydney Harbour, Japanese planes flying overhead and harassment on our coastline. Singapore fell. Australia was undefended. Stunned Australian families had followed the bombings and atrocities of the war in Europe, and the nation was gripped by fear, voting with their hearts, and without government sanction, anxious parents sent their children far away. Young children and babies were sent in thousands to ‘safety’. For some children, it would be years before they were reunited with their parents.